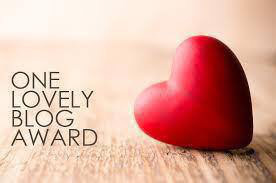 I was nominated by Be the Best You for the One Lovely Blog Award, thank you! I’m extremely shy until I get to know someone. This could take years but I do eventually show my crazy side if someone sticks around long enough. I love to scrapbook, I used to do it all homemade on the ground with all of my Hobby Lobby supplies but now I use Shutterfly. My back can’t take make homemade scrapbooks anymore. I love me some Jesus. I love church. I’ve been going to the same church for over 6 years and just within the last 2 have really started to get involved. I think this has something to do with #1 on this list. I’m taller than my husband. Not by much but enough that I notice and got rid of all my heels when we first got together. Maybe I will add some height back into my life this year though. I miss my heels. I love love love love food, not just gourmet food, I love bags of chips for snack and candy bars for breakfast food. I try not to eat that way anymore but I sometimes finish off a bag of chips without even noticing until my hand hits the bottom of the bad. Oops!